Instantly recognisable and deeply rooted in the human psyche, the human skull when encountered possesses the seemingly relentless power to provoke and demand reaction from all mankind, invoking emotions and images which seems to resonate right through to our deep subconscious. 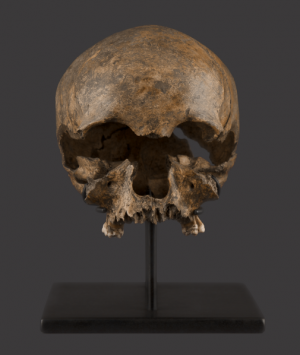 The practice of keeping human skulls reaches far in to antiquity with diverse motivating factors. Our pre-historic ancestors certainly placed value on them. 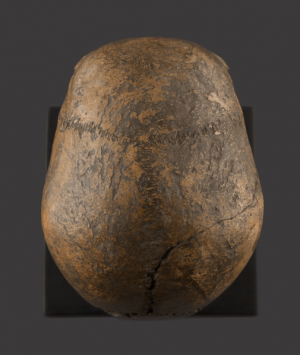 Recent archaeological evidence confirms the use of human skulls as ritual cups as far back as 14,700 years ago. The Iron-age Britons routinely took and displayed the heads of vanquished enemies and placed considerable value on them, venerating the skull as the seat of human consciousness and apparently regarding them as objects of luck, strength and power, a custom believed to have been outlawed by the Romans soon after their conquest. 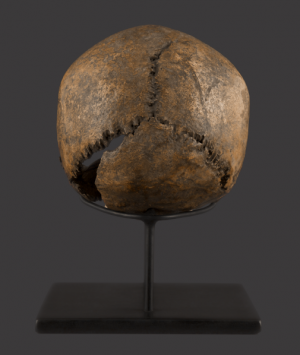 However from the medieval period through to the 18th century, human skulls, both real and fabricated, (often carved from ivory and wood), became hugely popular objects and their symbolic purpose could be interpreted as individually and variously as those who chose to keep them. 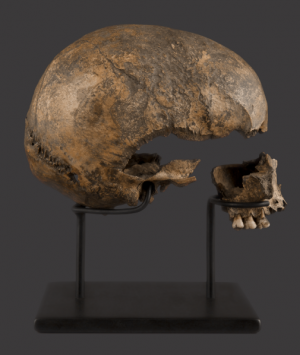 A popular visual warning against sin and corruption, the human skull was much associated with the church and was commonly used as a devotional object of remorse and penitence. Scholars and philosophers saw the skull as being synonymous with wisdom and learning as evidenced in its reoccurrence as an image, frequently encountered in renaissance art, residing on shelves, desk tops and piles of books. However its most widespread function was to serve as an ornament, a constant and potent reminder of ones own mortality, known as a ‘Memento Mori’, (Latin phrase for remember you will die). Apparently ever popular, in more recent times, the use of the human skull has seen something of a revival in contemporary art. It appears our fascination with the skulls of our own species endures and their appeal and significance to us remains un-diminished. 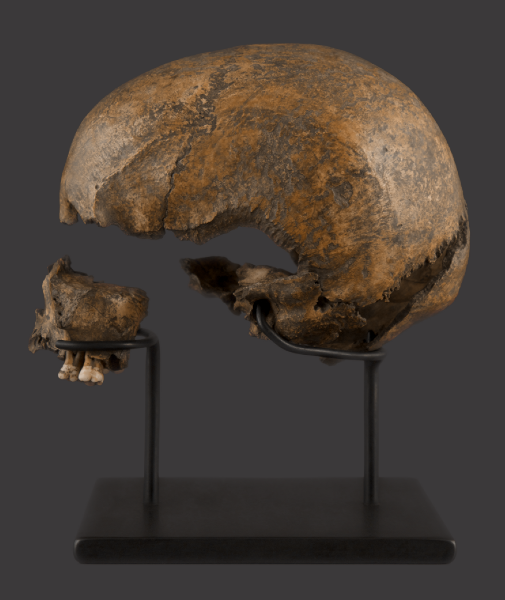 This small skull from a young female was discovered during post war archaeological excavations in the city of Utrecht, Holland and was reputedly recovered from a disused, filled in ‘plague house’ cellar, purposefully sealed up with masonry, probably during or shortly after an outbreak of the disease. The skull has acquired an attractive patina through prolonged burial and subsequent handling.